This post contains affiliate links, which means I receive a small commission if you make a purchase using a link. 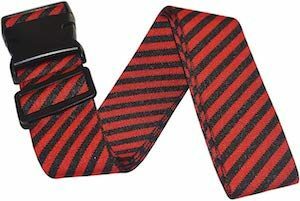 If you like to make finding you suitcase easier then think about adding this Red And Black Striped Luggage Strap. The luggage strap comes in a set of two so that you can use it on two suitcases or you can make a cross shape strap configuration. The strap is red with black diagonal stripes and it has a clip without a lock and it is adjustable in size to make it fits all your bags. A luggage strap like this makes it easier to spot you luggage on a belt at the airport and it also makes sure you suitcase keeps closed. And if you don’t like red and black stripes then click on the picture to see other color options. This entry was posted in Uncategorized and tagged Luggage Strap, stripes. Bookmark the permalink.